2018 is the one hundredth anniversary of the creation of the Royal Air Force (RAF) but for one reservist squadron this year is also the ninetieth anniversary of its creation. In order to celebrate the anniversary 504 (County of Nottingham) Squadron have been involved in several major events throughout the year including a parade with their Honorary Air Commodore the former Lord Lieutenant of Rutland Sir Laurence Howard, an all ranks dining night attended by former members of the squadron and a parade through the city of Nottingham that coincided with Battle of Britain Sunday. 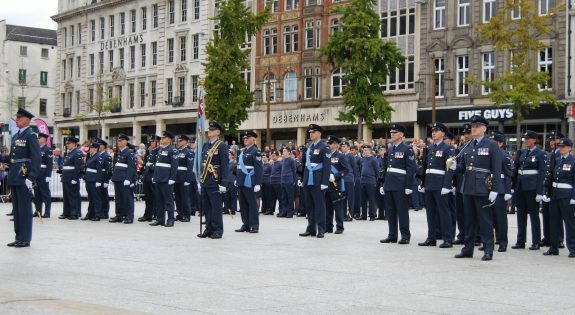 The parade in Nottingham was led by the RAF College Cranwell Band and was supported by local Air Cadet Squadrons. After a short service in the local church the parade moved into the Old Market Square where they were inspected by the Lord Lieutenant of Nottinghamshire and the Lord Mayor of Nottingham. 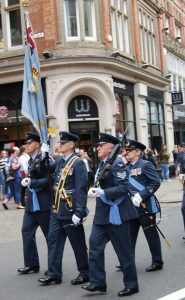 Senior Aircraftman Bryan Ford who works for a local council as a Refuse Collection Driver has taken part in both parades, he said: “I was a bit anxious about the parade in Nottingham because it was so important. 504 (County of Nottingham) Squadron was formed at RAF Hucknall in Nottinghamshire in 1928; it was a Special Reserve Squadron that had an active flying role under Bomber Command. Shortly before World War Two it was transferred to Fighter Command and was one of the Hurricane squadrons rushed to France in 1940 in an attempt to counter the German advance. Subsequently the squadron performed an active and gallant role during the Battle of Britain. It was during the Battle of Britain that Sergeant Ray Holmes was forced to perform a mid-air ram on a German bomber intent on attacking Buckingham Palace. This scene would later be depicted in the film Battle of Britain. 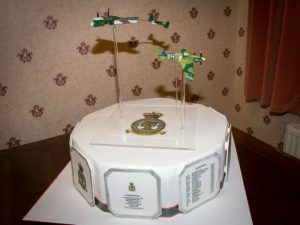 For the squadron’s anniversary dinner a cake was created that depicted this famous event. In the fifties, as the jet age began, the reserve flying squadrons, including 504, were disbanded but the squadron was brought back into existence in 1998 when an Operational Support Squadron took over the name. The squadron now based at RAF Wittering has a logistics role. Its personnel include logistics officers, chefs, drivers and supply, storage and distribution specialists who perform a critical role providing logistic support to RAF operations.